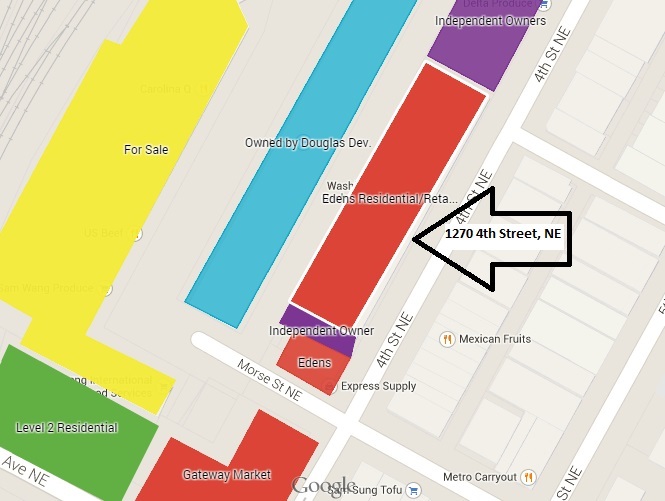 Union Market developer Edens has a major retail tenant for its future retail/residential project at 1270 4th Street, NE in the Union Market area (top red box on map). Speaking at a meeting of the Advisory Neighborhood Commission (ANC) 6C Planning, Zoning, and Environment Committee last week, representatives for Edens gave a presentation on their plans for the 1270 4th Street parcel that is to the southwest of Edens’s existing Union Market building. Edens is planning an apartment building with major retail on the first and second floors. According to Edens, they already have a culinary retailer who will occupy the retail space and who will create a Union Market-style eatery space. The retailer is apparently a significant name in the culinary world that people will recognize, and this project is the first of its kind for this person in the United States. However, the identity of the retailer is not being released because the project is several years away from breaking ground. When an ANC Commissioner joked that it was Eataly (there have been rumors that Eataly is coming to a different part of town for years), Edens joked that it was a good guess but not correct. We reached out to Edens after the meeting for additional comment but did not hear back. View our interactive Union Market map here.